Welcome to The Dark Side! 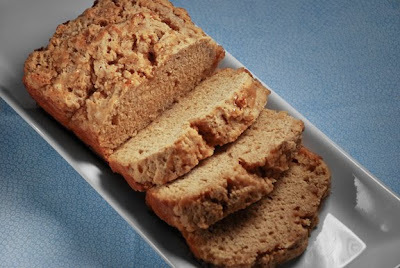 As sort of a “soft opening” approach, for my first post I’ve made a simple beer bread to accompany a delicious Ginger-Lemon Carrot Soup on avacatau.com. Once you see how easy it is to make this bread yourself, you’ll never buy one of those overpriced beer bread mixes again. I choose to use a 50/50 mix of whole wheat pastry flour and all purpose flour, but you can use just 3 cups of all purpose flour if you wish instead. It is very important not to over mix the batter or the bread will be chewy and tough. *I used a mix of 1-1/2 cups unbleached white flour and 1-1/2 cups whole wheat pastry flour, but feel free to use 3 cups all purpose flour instead. In a large bowl combine the two flours, baking powder, and salt. In a separate bowl combine the beer with 3 tablespoons honey. Pour the beer over the flour mixture and stir until just combined. DO NOT OVER MIX—it’s ok if the batter is lumpy. Pour half of the butter into the bottom of a metal loaf pan. Pour the batter into the pan and then pour the remaining butter over the batter. Drizzle with the remaining 1 tablespoon of honey. Bake for 30-40 minutes, until a toothpick inserted in the center comes out clean. Cool slightly before slicing. I love the look of the dark side page. Nicely done!!! 1/2 "what" of butter? I don't see anything unhealthy here! BTW, I've been making my own baking powder for several months with excellent results: 1t baking soda + 2t cream of tarter + 1t of cornstarch. Mix well and keep in an airtight container in a cool, dry place. I used 1/2 stick butter - 1/4 cup. It seemed like a lot going into the loaf pan, but it worked out well. Not too greasy and the crust was nice and crunchy.